Janelle In Real Life: so much love for fall. Happy Monday! Our weekend followed the normal Saturday routine including lots of watching football. We ALMOST watched all of the BYU-Utah game on Saturday... it didn't start until like 8:15 and around 11 we were pretty sure that BYU wasn't going to win, sooooo we called it a night. We are sort of lame fans and also 80 years old or something. And here's another of my transition to fall outfits... the sheer blouse makes it nice and cool but it definitely has some fall vibes and will layer gloriously. I'm so in love with these booties. I'm actually a really particular person when it comes to certain things in my closet... when I go out to find a staple piece, I do my research. Lots and lots of online shopping, buying things and then returning them until I find just what I want. I settled on these booties and turns out they're pretty great. Lovely! The shirt is gorgeous. Such a cute fall look! Those booties are a great find. I love the caramel apple spice from Starbucks, too! I crave those caramel apple spices all the time! Love the booties! This is my uniform - for real! I love fall weather! Found you via the My Greatest Hits linkup! Fall is the best, right? Thank you! I love the necklace so much and it was sort of an impulse buy... but I'm glad I got it! super cute outfit with booties- inspired me! I love the print and fit of your top. And you're right, those booties are pretty awesome! Well thank you! I'm a big fan of the print as well! I love those booties too! I almost bought the red ones! Gorgeous blouse too :) I have to go check out this caramel apple spice at Starbucks now!! I love the red ones! I've been seriously contemplating getting those too. And you really should try a caramel apple spice! So fall-ish. So glad I found your blog! I am a new follower! I've been slow on the booties trend too and I'm soooo glad I got these! They're so versatile... I've seriously worn them everyday this week. Stopping by from the link up! I absolutely love this outfit... and you are gorgeous! So nice to find you through the linky... looking forward to following! just found your blog and i love it! this is such a simply chic look! love those boots, i need to snag some this fall for sure! I am loving the fun print on that blouse! Your booties are perfect! I love them with this outfit! 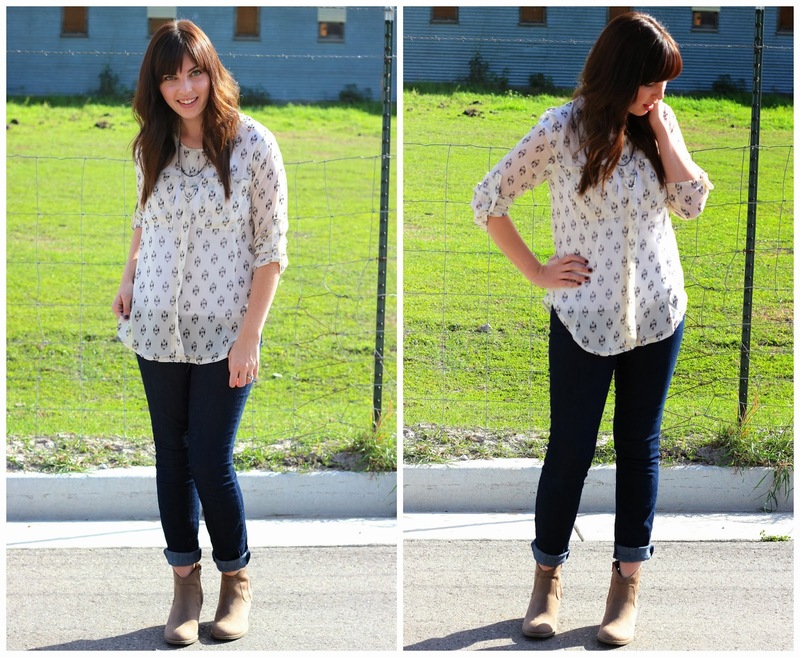 Shirt is super cute-- I love cuffing my jeans and wearing with booties, such a fun look!